Poor Penny Carson – Intersection Puppeteer! | JIFFY FEET – Southern Fried Awesome! 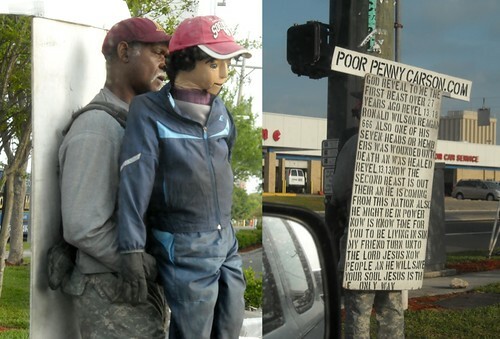 64 Comments on "Poor Penny Carson – Intersection Puppeteer!" I just saw this man packing up his puppet and his sign and getting into a very old RV. He’s been seen all over Ft. Lauderdale. His sign now says that both President Obama and Mitt Romney are the sons of satan. Saw him on 79 st and Nw 27 ave miami fl 33147. Poorpennycarson.com was at the intersection of SR441 and Hollywood Blvd at 8:30am on January 28, 2013. PICK A CURRENT TOPIC! Ronald Reagan died 8 years ago. As far as I’ve seen, he stops at a lot of busy intersections in the Broward County area; sometimes heading further East. He actually parks his RV outside the Publix I work at, and I have to say, I think he’s a vet of some sort. The back of his RV is written in a large jumbling of words that sounds like PTSD. I feel bad, but then again he might as well have a “THE END IS NIGH” sandwich board; crazy an losing it moreover. Just saw this at Peters and University. Ronald Regan died many years ago and that is all I am going to say. Who’s crazier…the guy with the puppet that I just saw on University drive and Sheridan street, or me, who actually came home and visited poorpennycarson.net? You be the judge. ← Polly Wanna Go 55mph? WooHoo!